President Obama announced Friday how his administration plans to respond to the damage caused by overbroad and illegal U.S. government mass surveillance. Unfortunately, Obama's proposed reforms are only a drop in the bucket of what must be done if he is at all serious about safeguarding the basic privacy rights of non-suspicious people being spied on by the NSA worldwide. In the scorecard we created to assess the president's announcement, we offered 1 point for each common-sense fix that would meaningfully address the abuses of NSA mass spying. Obama scored a disappointing 3.5 out of 12 possible points. This year got off to an exciting start when the Supreme Court decided to consider three copyright and patent cases in which EFF plans to file amicus briefs. One case, ABC, Inc. v. Aereo, deals with the future of innovation in television technology and broadcasting. In the Limelight Networks v. Akamai Technologies case, the court could decide to create a new, undeserving category of potential third-party defendants. And finally, in Nautilus v. Biosig Instruments EFF is urging the court to affirm the need for patent claims to be drafted in the clearest, most precise language possible and rule against the practice of vaguely worded patents. EFF has been tracking and analyzing state-sponsored malware for years. Having just finished a two-years-in-the-making report on malware used by pro-Syrian government hackers against opposition forces, we were shocked to hear that two of our activists were targeted by a Vietnamese malware attack that also appears to be state-sponsored. We took the opportunity to lay out the anatomy of a malware attack. In remembrance of the two-year anniversary of the SOPA blackout protests, EFF took a hard look at some of the key principles that should guide copyright reform, and we invited friends from across the Internet to join us. The result: more inspiring, deep conversations on the complexities of copyright policy than we ever imagined. 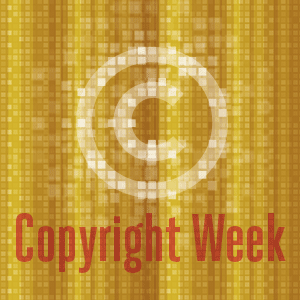 Visit the Copyright Week webpage to endorse the principles and read the dozens of fascinating contributions from organizations like Public Knowledge, Creative Commons, and the American Library Association. The issue of transparency in copyright policy has moved to the front of conversations around the world due to the controversy surrounding the super-secret international negotiations of the Trans-Pacific Partnership trade agreement. Secret political negotiations are toxic for democracy, and the TPP threatens to export horrible, out-of-touch intellectual property policies across the globe, without any public debate. More often than we might imagine, the laws that govern us are not available for the public, journalists, or researchers to access for free. Laws that are not in the public domain are antithetical to any good faith effort to establish political accountability. That's why EFF is representing Public.Resource.Org, an organization that publishes legal and government documents for all to access. Hidden within the 2014 Omnibus Appropriations Bill passed by Congress last week was a huge win in the fight for open access to publicly funded research. Specifically, the bill requires a large handful of federal agencies, including the Department of Education, to make access to articles that stem from federally funded research accessible to the public and online within 12 months of publication. It's a good start, but we're pushing for reform that would go even farther by granting the public full access to taxpayer-funded research. Users don't just need to "access" the devices and media we purchase. We need to own them. And by own, we mean that we need the ability to tinker, repair, learn from, and share our digital goods. When users are dependent on corporations to properly understand and utilize the technology they purchase, planned obsolesce leads to wasted money and electronic waste pile-up. Meanwhile, fair use is stifled, and innovation is discouraged by the threat of ending up in court. Fair use has long been defended as a cornerstone of freedom of speech. But despite the fact that the public interest value of fair use has been repeatedly affirmed in the courts, established media and technology companies are using filters that detect and block non-infringing copies online, closing the door on fair use claims before there's an opportunity to resist. It's time assert ourselves and demand meaningful copyright reform, grounded in fairness, rationality, and strong democratic principles that enables and encourages creativity. Together, we'll fix copyright and defend our freedom online. Join us. Tim Wu offers his perspective on the recent decision that struck down the FCC's authority to regulate Internet Service Providers to follow network neutrality principles as ISPs are currently classified. With this ruling, companies like Verizon now have the power to slow down or throttle data from any website that travels to Verizon customers, a power that threatens the future of an open Internet. The New York Times editorial board joined us in lamenting the federal court's awful decision to allow the Department of Justice to continue to keep the interpretation of surveillance law by the Office of Legal Counsel a secret. It was a bad day for democracy, but we've taken the opportunity to renew our vow to keep fighting to disclose vitally important legal opinions to the public. Google added a new feature that sends an email in your Gmail inbox if someone sends a message to your Google Plus account, even if they don't know your email address. Many users would prefer it not to be easier for strangers to send messages to their email inbox. Read EFF's guide on how to opt-out of this potentially privacy invasive feature. EFF staffers Eva Galperin and Jillian York will be running sessions and speaking at the 4th Arabloggers meeting. EFF Legal Director Cindy Cohn will join Daniel Ellsberg, Norman Soloman, and Shahid Buttar on a panel moderated by Robert Jaffe for a lively discussion on the history of surveillance, the mounting controversy over NSA spying today, and what's at stake for democracy. Proceeds will benefit the Bill of Rights Defense Committee. In this double-header presentation at the Association of Alternative Newsmedia's 2014 Digital Conference, attendees will learn about how the unfolding digital surveillance scandal impacts the news industry and what alt-weeklies can and should do about it. At the California Public Defender's Association Juvenile Defense Seminar, EFF Staff Attorney Hanni Fakhoury will present on the topic of "Ethics and Social Networks." Join a hackathon on SecureDrop, the open source whistleblower submission system originally developed by Aaron Swartz. This San Francisco event will take place in the ThoughtWorks office, alongside a sister event at MIT. EFF Activism Director Rainey Reitman will lead a Q&A on privacy and surveillance in the Internet age following a screening of the new documentary Terms and Conditions May Apply. At the California Public Defenders Association's annual "New Statutes Seminar," EFF Staff Attorney Hanni Fakhoury will speak about new—and not so new—technology statutes. On the anniversary of Aaron Swartz's passing, and in celebration of the win against SOPA and PIPA that he helped make possible, we are planning a day of protest against mass surveillance. Join us. EFF's Director for International Freedom of Expression, Jillian York, will be speaking about the global societal implications of surveillance.